Elbrus! The highest summit of Europe, as some say. 5652m – an enormous volcano with a twin peak. An amazing mountain. And likewise amazing its skiing areas is: a fascinatingly monumental russian cable car from sowjet times leads up as far as 3450m. Subsequently, further lifts go up almost as far as 4000m, all this in a unique breath-taking scenery. However, we are unlucky again: a sever snowstorm is shaking the concrete of the old sowjet buildings, still, the cable-car is withstanding up, taking skiers up to the second station at 3450m. The wind is brutal, and the snow is piercing the face. It is an adventure, not more and not less. Of the unique potential of this mountain we will see only a tiny bit, but it remains an unforgettable day anyway. The cable-has the particularity of not being level with the platforms – which are icy and in combination with the swinging gondola tricky beasts. The visibilty mostly is very poor – and the storm breathtaking. We do a few runs until the early afternoon – and finally find ourselves defeated by the mountain – for this time. While silently driving down the valley again, we will need to take a decision. The weather keeps being pretty unstable over the next days, and in worst case we are probably going to see as much snow and rain as we had seen over the last week. Moreover, the strong winds have shifted a lot of the recently fallen snow which makes the snow conditions (and the avalanche conditions) difficult. It seems, it is time to leave the Caucasus for this time. As impresseive as these mountains are: spring is probably the preferable time for skiing. This leaves us with two options: the sourther itinerary to Georgia, Turkey and the Balkans. And the norther itinerary to Scandinavia. The southern road involves risks of more bad roads, political insurgency in Turkey after the latest attacks in Istanbul and instable weather conditions and suboptimal snow-conditions. The northern itinerary invovles thousands kilometers of drive, possibly very low temperatures and hence several unknowns. Not an easy decision. We decide to take the night to check latest reports on the web, and think about it calmly. And hence we approaching one last time our beloved Grand Hotel Kavkas in Naltschik. A beautiful night-time walk through a parc and a nice dinner (though involving screening an Amercian comedy ressembking Eddi Murphy’s style and synchronised in Russian, which feels somewhat weird 😉 ). Let’s see what the next day is going to bring. Finally the new day dawns fair. The deep hanging, depressingly grey clouds of the previous day have vanished and reveal high-alpine mountain scenery surrounding this narrow end of the valley, in which lies Dombai – one of the classic ski resorts of the Caucasus. One of the more peculiar things about skiing in Russia (and some of the other states formlery part of the Sowjet Union) is that it is not too extraordinary that one and the same mountain has been developped by several independent lift companies over the years. In Domabi, e.g,, there are three of them. That means that you can choose between three independent chains of lifts to get to one and the same summit, each of which requires an independet skipass (=payment). They all serve (more or less) the same slopes. Sometimes, giving some Rubel to the lift’s operator helps, if you want to use one of the other lifts once (in Dombai we did this once on the highest lift, which is relatively new and not part of the company at which we had bought). We choose a classic line: the chain of four chairlifts dating back a couple of decades, which will lift you to the top at over 3000m altitude in no less than 54 min (sic!). Lots of time to enjoy the vintage lifts and the great panorama. Tickets are sold in a little office with a desk in the valley. The first leg: a vintage single-seater charilift, which has the peculiar particularity to pass “under” the tree (instead of between or above). The weather gets worse and worse in the afternoon, the air temperatures drops significantly and a chill wind keeps whiffing over the exposed mountain flanks. In the late afternoon we are skiing down back into the valley, stow our skis and start to drive down the valley. While Dombai and the Elbrus, where we are heading next, are spaced less than 50km as the crow flies, the road takes a long detour, which makes a 5.5 hour drive. We following the road back out of the valley as far as Karachaevsk. From their a small mountain roads heads eastwards. The Caucasus always gives a somewhat remote, not to say “wild” feeling when driving its roads, especially its side roads. This one passes a few isolated houses still in the beginning, but soon these will disappear, leading for kilometers through a dark wild countryside, and no lights and domiciles come into view for what seems ages. Kilometers and kilometers the narrow road whinds up into the mountains in several bends, the tarmac starts to freeze and is finally nothing but a thick layer of ice on the windy pass around 2000m of altitude. A treacherrous drive, less because of the ice itself (with some experience and the help of the studded tyres this can be handled), but more because the icy surface is highly uneven, full of deep holes and severe threats to the car’s suspension. Finally, an hour or so later, the lights of Essentukskaya ( – please learn all the villages’ named in the blog entry by heart until next Tuesday 😉 – ). We run into another police check-point- there must have been more than 25 over the last few days. This one is a slightly smaller road, and the control runs less professional than the previous ones. After the usual russian words requesting several documents, the police officer suddenly requests a translation. I find this highly unusual. None of the previous ones ever even asked for a translation (the symbols on the driving license are pretty self-explaining anyway). So I keep insisting that I would not have a translation, but that the symbols should do. The police officer requests me to come into the post. A gloomy gangway into a backyards, dogs running around me, then I find myself back in a somewhat shabby room, face to face with two police officers. I am pretty sure I know what they are after: money. So, this is going to be a game of patience. We are playing the game for some 15 minutes, until I receive my documents back and leave the check-point: without paying them any bribe. We continue on our road, the traffic around Pyatigorsk at night is even worse than in the dayilight, and it costs lots of concentration to prevent accidents (including those which would not be your fault, but still in fact a desaster for us). It is late in the evening when we turn into the valley to Terskol. Tomorrow we are expecting another fair day at Elbrus by the forecast, but the signs in the sky clearly indicated the opposite today. And really, a strong chill winds is blowing down that valley and it begins to snow again. We run into another checkpoint, and again I am being asked to come into the station – allegedly because I did not stop at the stop sign (which is halfly true: you usually slow down and then slowly pass-by to allow the police officers to stop you if they want, but nobody stops to a full halt in order not to slow down the traffic). The day is dawning fair for the first time in days. The mountains are clad in thick, bright white snow, just like glued in ice. This is promising to be the best skiing day so far. Rosa Khutor, alike all four skiing areas close to Krasna Polyana (Sotchi) is an industrialised skiing area, lacking the high, prominent and distinct mountains which have made the central part of Caucasus famous. Still, the amazing snow conditions guarantee for a greet day in deep powder – though an avalanche risk of 4 out of 5 means keeping prudence – absolute prudence. Gentle runs in the woods at the lower part of the skiing area. We keep following the narrow and curvy coast highway along the Black Sea coast up north for while, until we reach Tuapse, where we are going to spend the night, to continue our drive early next morning. The following day is not much less gloomy than the one before, but we can’t stand another day hanging around, so we decide to go skiing on the two open slopes of Gornaya Karusel. All in all the valley has badly suffered from the Olympic Games. Large, anonymous infrastructures: railways, highways, faceless apartment buildings… the ultimate non-lieu. From a large underground garage a few stairs lead up to the cable car. To enter the station going through a security check just like on an aiport is required. In the gondola, I open my backpack to change gloves and get ready for skiing. A railway crossing on a free-way: somewhat unusual, at least to us. The first gondola leads to the upper ski resort, despite of the bad weather many people are outside, children and grand parents, a merry life, lots of music, food stands, all sorts of winter sports. Otherwise, the skiing area has witness enourmous bulldozing of the slopes, which does not make ski runs more intersting and environmentally is a nightmare. Still, the snow is great especially on the closed runs. At the gondola station we are approaching one of the operators. He is, again, extremely helpful. He allows me to use his smart phone to translate from English into Russian what the issue is. It takes two phone calls and less than five minutes until the backpack is found. I am being offered a cigarette (which I gladly accept), and he phones somebody else who speaks English to allow for a bit of conversation. We have a very friendly talk, while the backpack is being sent by cable car and ten minutes later I have it back with all my documents. That was an amazing experience. We spend the rest of the day doing some skiing on the ungroomed slopes in the fresh snow, before we return downwards, this time to a hotel is Krasna Polyana, the main ski village, to go to Rosa Lhutor tomorrow. The Elbrus. Highest of all peaks in Europe some may say. 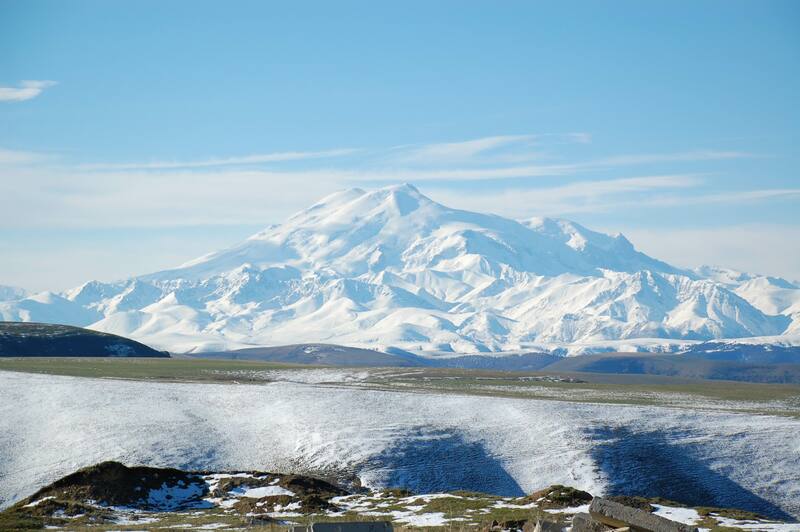 And home to two of the most amazing skiing areas of this continent: Elbrus skiing area itself, and Cheget. All of this in a stunning scenery of summits beyond 5000m of altitude. Today, however, nothing much of that scenery wil be visible: clouds are hanging low and it’s snowing. Nevertheless we have decided we would – finally – like to ski a bit, and so we’re on our way to Cheget. Cheget is beautiful skiing area full of fascinating slopes in a stunning environment. Snow conditions will be feeble, though, and so will be the weather. We had a great day, anyway. So here are some impressions. Road into the Caucasus Mountains. Myself in the Cheget Chairlift, section II. Sowjet technology, built to survive centuries. It is shortly after six when we hit the road again. In the center of Saratow the road crosses the railway. The railway gates are down. A lonesome worker clears the rails from the snow with a snow shovel. One minute, two minutes, five minutes, eight minutes… . We are wondering whether he is not afraid of the approaching train, and whether this work is not somewhat a sysyphus work anway. After what seems an eternity, he leaves the train tracks and approaches the little hut next to it. He hits a button – and the gates open. There has never been a train approaching, he simply closed the gates to be able to work without interference from the road traffic! The highway south of Saratow leads through open lands. Settlements are very sparse, but the road is good and fuel stations are relatively frequent. Later, the sun has already risen, from a hilltop we are looking down on what looks like the frozen sea: The Wolga. It is frozen. And it is so vast here, many kilometers wide, that the far shore is out of sight! The road crosses wide hills, the sun is setting, Elista lies behind us. it is around midnight when we reach Naltschik. The trees are snow-ladden, when pass ancient gates into an old parc, under fresh white thick snow and beautifully illuminated. In the center stands a large old house, a domicile for tonight: The Grand Hotel Kavkas. The icy Russian night cloaks the world and keeps it silent. I am standing in the dark, leaning against the large panorama window panes of the suite, glancing at the frozen Wolga. I am reflecting our plans, checking the next legs of the trip on Google Maps: to the border of Kazachstan, then Oral, Aktobe, Aral, Shymkent – probably one of the most fascinating, and certainly the loneliest and most remote part of the trip. 520km to Oral, another 475km to Aktobe and from there another 620km to Aral. Southwards of Aral settlement will become more frequent, but between Oral and Aral there are parts in which the road passes through the desert without passing any facilities for over 200km. Interestingly enough google maps shows a couple of traffic jams on the roads. Usually this indicates one way operation due to construction sites. Many nights I have spent with preparations, going through options, making estimates, evalauting challenges and chances, trying to minimise risks. Nights and hours of research and consideration. All these theoretical thoughts now add up for the first time with practical experiences with the Russian winter. First of all, the car. The operational envelope goes down to minus thirty degrees according to Audi, but this is not a quantum leap, not a digital transition from one to zero. Fatigue. Fatigue increases when components are brought close their operational limits, and what may work for 50.000km or more in Central Europe, may malfunction way quicker in the Russian winter – a phenomenon not unheard of. This alone would not concern me, I was expecting that and this was why some of the most exposed parts had been replaced prior to the drive. And I was prepared to go and seek a garage occasionally for minor repairs. What concerns me slightly more is that I would have expected a more dense network of Audi/Volkswagen Services in Russia based upon the fact that these are among the more popular cars of Western manufacturers in Russia and that I would have expected spare parts to be available more easily than we experienced in Kursk (though it is hard to tell to which extent this was a result of the Russian holidays, which I expect it is). This is, however, not very promising for Kazachstan, in which I should expect an even lower availability of spare parts. Taking into account that being stuck in a remote place would cause several follow-up problems (most of all with the time frames of our visa plus customs issues), I find this thought concerning. Secondly, we are now going to enter the most exposed part of the road. Northern Kazachstan is already under the influence of the central Russian climate, likely to experience cold surges from Siberian air in winter. It is unusually cold these days, much colder than I expected based upon the available general weather and climate data. Driving the car on its operational limits in a very remote and to us unknown environment does not comfort me. While I am glancing out at the frozen Wolga, I feel a certain uneasyness. Going into the mountains teaches you certain experiences. Play to your instincts, first of all. But also make rational considerations in an irrational environment, an environment which provides far less information than would be necessary for clear decision-making. This involves risk-evaluation in complex risk environments of different, independent overlapping risks, which by themselves may not trigger a no-go decision, but in combination very well can. Moreover, preventing oneself from seeking for the signs and considerations, which would allow you to go and to not abandon your plans, but instead positively seeking for those which indicate a no-go and hence to be open for the decision not to go, regardless of what you already have invested to this point. Way more difficult than climbing a 4000m plus summit, is getting down safely again. Many mountaineers have died not on the climb, but on the descent – because they had missed the point of no-return. This, by the way, includes the ability not to question your previous decisions subsequently, only because it turned out that against the odds it would have been possible to go. You need to remind yourself that you were deciding under the lack of crucial information, and that therefore your decision remains a right decision, even if the random elements coincidently turn out to have been more positive than you expected, because precisely this was not foreseeable. In other words: what ex-post might have been possible, remains impossible ex-ante, and therefore the ex-ante decision not to go was the right decision. If you do not follow this maxime, you almost certainly will experience the risk-shift effect, which is known from avalanche risk evaluation. Human nature tends to shift to more and more risky behaviour, whenever a decision involving an unkown risk turns out to be still (apparently) safe. Consequently, skiers are known for tending to decide for more and more risky slopes, because all previous slopes had turned out safe, until they finally cross the invisible limit and trigger the avalanche and possibly pay for this wrong decision with their lives. By sheer logic this triggers another consequence: whenever the limit is unknown, it is impossible to take decisions which remain within the framework of safety, without keeping a safety margin. Any safety margin will always lead to abandoning options, which possibly still would have been safe. As a result, deciding against an option which would have been still safe, therefore does not indicate a wrong decision, but simply must occur whenever taking safe decisions. Subsequent knowledge that a certain discarded option would have been (still) safe, therefore automatically must occur, and so hindsight cannot serve as an evluation tool for previous decisions (at least in most cases). Really, rather the opposite is the case: if you ever witness a slope that you seriously considered, but against which you decided, being triggered and going-off, you have come dangerously close to that invisible limit. Really, you should not have ever considered this slope in the first place, if your decisions were good. The art of climbing mountains is not as many think based upon continuing until reaching the summit, but on the ability to turn back before crossing the point of no return, and regardless of previous investments into your undertaking. All this speaks against this road into the ice desert. Let it be remote, fine. Let the car be more challenged by the Russian winter, fine. But temperatures at the lower limit of what we expected and the car probably being more likely to suffer from fatigue already before the operational limit of -30°C, is a combination I do not like. Approaching limits so far that your last fall-back scenario remains your only option, I do not like either. And then there are these faint signs, just like in the mountains. In the mountains this can be subtle changes in the sound of the snow, or in the feeling when touching upon it with your skis. It can be the look of icy shapes, or something not even accessible by the rational part of your mind, but rather a feeling of unusuality. I have expierenced this a couple of times, and almost always it had been significant. Traffic jams in the desert of Kazachstan? I had not seen any such indications on google maps before. This does not make the theory of constructions sites – although this would be a typical explanation in other circumstances – very likely. And I hinder myself from searching for explanations which would reason why this observation was harmless. Rather I try to seek for more sinister explanations, reasons not to go, if there are any. Now, if these traffic jams occur suddenly and in several locations, this only means the cars are slowing down at these spots. Now, this indicates that the road conditions have changed suddenly and somewhat unexpectedly. It therefore rather indicates that weather conditions must be harsh, and that the road has come close to impassable, and that road services are working on their limits to continue to keep it open. I am checking the weather reports; -22°C for Oral, -24°C for Aktobe. This I knew. Then I start to check for the smaller settlements: -26°C, -27°C. Really, that means that on the open road between the settlements temperatures must be about to drop below -30°C – jointly with heavy snowfalls and strong winds, Probably the cold and the snowfalls are about to block the road. That is the final piece in the puzzle: I have taken my decision. we will not continue to the East. Thjis means that we will miss out one of the most exciting part of the road, and the we will never reach our original destination: Kyrgistan. Instead, we will head for our alternative goal – the majestetic mountains at the Southern Border of Russia: The Caucasus. The alarm rings early this night at around 4.45 a.m. local time. We discuss the situation, and re-set the GPS: the first way point lies 375km to the south down that famous river; Wolgograd. The city that once was known as… Stalingrad. A mild winter light illuminates the outskirts of Kursk, which seem to lie still and peacefully, asleep in the cold. Temperatures have dropped to -19°C again. We are following the highway eastwards towards Voronezh through wide and open lands. The first kilometers on the studded tyres bring new experiences. Their sound is clearly audible, but not too disturbing. The steering on clear asphalt is slightly more indirect and the tyres tend to drift, which is not suprising as clear asphalt is not what they are made for. On the more snowy surfaces they’ll show more of their strengths later today. Would you like to wait for a bus (-18°C)? Dusk is falling early and the sun has set when we reach Voronezh. Crossing the river Voronezh shortly before it enters the Don. We refuel the car. Ekto-Diesel at LukOil Fuel Stations remains operational down to -37°C according to the fuel station’s personel. That should do (I hope). Peculiar detail: you are required to pay first, which means that you’ll have to indicate the amount of fuel you’ll want to purchase, which kind of hinders you to fully refuel, if you want to stay on the safe side in terms of not buying more than fits the fuel tank. Eastwards of Voronezh lands are getting more lonely, and the climate rougher. While roads had been totally dry up to Voronezh and a hundred kilometers beyond, it slowly starts snowing and the wind freshens up. The long drives through dark winter woods make me think of music like Klaus Schulze’s Velvet Voyage ( http://www.youtube.com/watch?v=XT6zVDwmzUg ) and some Norwegian Black Metal Albums. Around 200 kilometers behind Voronezh we are clearly in a different kind of region than we used to be. Settlements are sparse, the road no longer ressembles a western country road, but a true russian highway, the storm blows snow across the tarmac and large trucks are thundering towards Wolga river, creating huge trails of snow swirling through the night. Around midnight we finally reach Saratow, a Wolga town (and formerly home to the so-called “Wolgadeutschen”, which were later deported to Kazachstan, but have left their mark upon the town’s architecture). It is the last outpost before the road will finally disappear into the vast desert lands of the Russian-Kazachstan border. We have booked in advance a nice hotel with a view on the famous, large, Wolgabridge – primarily, because it offers a garage. We will certainly need it, if we intend to start the car’s engine tomorrow morning…. The car’s thermometer this morning shows -19°C. Very reluctantly, of course, that is. The display is malfunctioning due to the cold: the liquid crystals don’t seem to be too liquid any more. The entire care is coverd in a chrystal gleam, the snow scrunches under the feet with each step. The breath is freezing to the car’s window panes. It takes ages to start the car. For around 30 seconds nothing happens at all. Then, an onccassional blow, the car shakes. Slowly these blows increase to occur, the engine starts running very slowly at around 400 rpm but still needs the support of the starter motor. After like 90s finally the combustion itself keeps the engine running, still not on all cylinders, but the inital heat created by the first ignitions finally makes all cylinders stabilize. Two minutes later the engine is running normally. We are driving again to the Volkswagen Service, a modern post-2000 building at the outskirts of Kurk, and this time, really, the service center is open. We receive a warm welcome and the car is being driven to the “express service” lane. We are trying to explain our problem with gestures and rudimentary Russian knowledge (nobody speaks English at all, including the sales personel and the manager). We also ask them to mount the studded tyres – and only then I notice that I have forgotten the box with the wheels’ screws at the reception desk of the hotel. A short call by my co-driver, and the receptionist is taking care of the screws. Meanwhile, the servicemen are examining the car and its generator in a huge hall, echoing russian dance music. After some time, we are speaking to what appears to be the manager and it turns out that in their view the generator needs to be serviced, but they would not have any presonel to do that. This reminds us of yesterday. The voice with the heavy Russian accent is echoing in my mind: “Best you go to Volkswagen tomorrow. If they cannot repair it, you call Victor.”. We are showing the photo of the old drawing of the location of Victor’s place to the manager. He gives Victor a short ring, all seems well. A few minutes later “Taxi. Victor”. – “Da.”. One of the servicemen and my co-driver a driving to Victor. For a good while I don’t hear anything, until they return. “The generator was broken, not only the carbon brushes.” – “Oh, really? Never heard this would happen at all. Usually it is always the carbon brushes being worn out.”. – “It seems, in Russia this happens more often.”. The servicemen remount the serviced generator – and the car produces full voltage again. We are quickly unloading the car to access the studded tyres – as quickly as this is possible with the large amounts of luggage that we are transporting and while being in a service garage. The serviceman mounts the centrification rings and starts to mount the tyres – they still don’t fit. I’m perplexed. The entire equipment was sold based on the car’s precise data by a professional German seller. What the… ? It turns out the screws are not fitting – they are too long. They simply packed the wrong screws. We are re-using the old screws, all tyres are being mounted, and finally we are ready to go. The entire service costed around 35 EUR + another 100 for Victor (which must have been the deal of his life, but that was ok for us). We shortly return to the hotel, before in the early afternoon we begin to head eastwards again.